Chinese hand-made oil paintings have destroyed the livelihood of local artists. Traditional artists no longer are able to compete. Rembrandt finds himself sitting under the fortified wall of the medieval Principality of Monaco. The Rock on which the ancient buildings and Prince’s palace sit, appear above him. A background to the artists , seen painting below, is the red brick and granite stone steps of the Porte Neuve leading up into the fortress. A dejected and suffering Rembrandt sits on the left comforted by his female companion. Behind them stands a Saint Veronica-like figure holding a towel, on which is represented the head of the ageing Rembrandt. In ancient artistic iconography Saint Veronica is a pious woman who bathed Christ’s face on the road to Golgotha to be crucified. 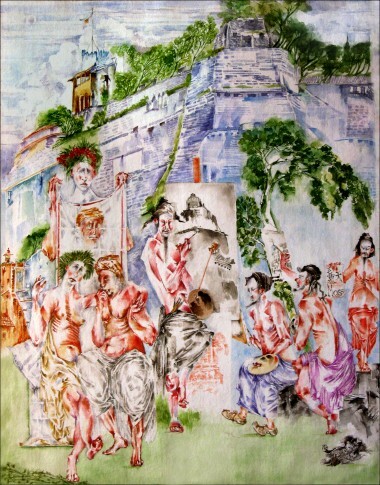 Four Chinese artists, wearing their hair dressed in the Manchurian-style, who appear to have relocated to Monaco, are painting views of its forbidding rock defenses. On the bottom right centre, where two of the Chinese artists are seated on a rock, is a tiny Pekinese, painted in a warm sepia-black tint. The terrier is lying, on his back legs in the air while regarding the viewer. Another artist is standing above him with paint brushes in his left hand. In his right he holds an open scroll with the artist’s signature in Chinese characters.